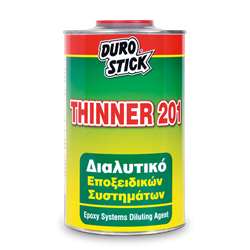 Thinner for the exclusive use with two component epoxy systems and for the cleaning of their application tools. Consists of glycols and a mixture of aromatic hydrocarbons. Not recommended for use with enamel paints and varnishes. • 1-5% in DUROEPOXY PRIMER and DECO EPOXY PRIMER.